Six-year-old George Washington and his family moved to the land we call Ferry Farm late in 1738, perhaps even in time to mark Christmas in their new home. If so, it was the first of many. George lived at Ferry Farm into young adulthood. Interestingly, the best documented Christmas he spent in Fredericksburg was actually in 1769, long after his boyhood years, and it paints a picture of the holiday as typically celebrated in Virginia, past and present. George Washington at age 40 in 1772, three years after the Christmas of 1769. By J.W. Paradise (engraving) from a picture by J.G. Chapman after Charles Wilson Peale [Public domain], via Wikimedia Commons. On Christmas Eve, which was a Sunday, George “Went to Prayers, & dined afterwds. at Colo. Lewis.” The prayer service he attended probably took place at St. George’s Church, an wooden structure located on the site of today’s St. George’s Episcopal Church. 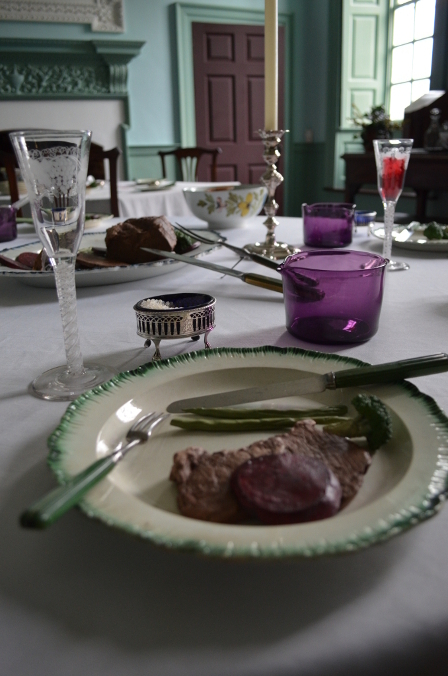 Many colonial Virginians combined the holiday’s religious nature with secular activities such as parties, much as we do today. Washington was no different. After his morning at church, he passed the evening in Julian’s Tavern with Edward Jones, the overseer of Ferry Farm, where George’s mother Mary still lived. This tavern was located at the corner of Amelia and Caroline Streets. Christmas Day was spent with the Lewis family and George won 2 pounds and 5 shillings playing cards. 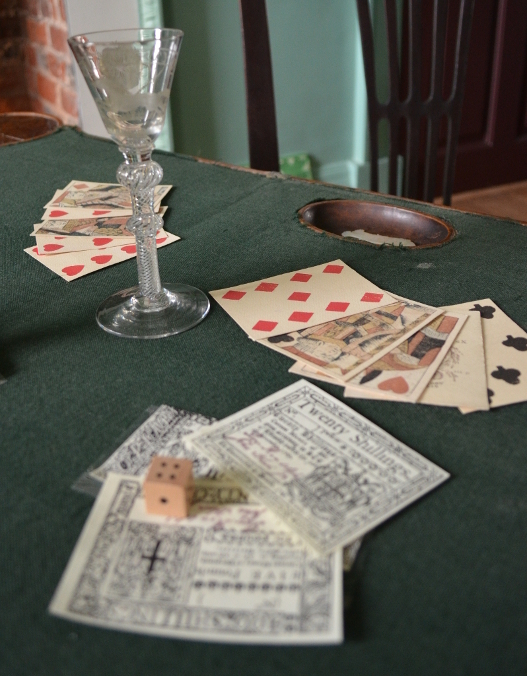 Card playing for money was another aspect of Christmas carousing enjoyed by Virginians, whether men, women, or children. Popular games included whist (similar to bridge), and piquet (similar to rummy) and were great ways to pass the time when visiting family and friends during Christmas. On December 26, Washington prepared to continue his journey home by going to to the barber and paying for repairs to his carriage. Before leaving, though, he again “Dined at Colo. Lewis” and then “went over the River and logd at my Mothers” for his final night in Fredericksburg. After giving Mary 6 pounds in cash, George left Ferry Farm on the 27th and arrived home at Mount Vernon on December 28. The Christmas season of the colonial era lasted much longer than ours does, extending into January and concluding on Twelfth Night, a festive evening to mark the end of the Twelve Days of Christmas and celebrated much like our New Year’s Eve is today. During the first days of 1770 at Mount Vernon, Washington and his family continued visiting friends and hosted two dinners, including one on Twelfth Night. It appears to have been a relatively subdued affair with only immediate family and four or five neighbors. Three years later, on January 6, 1773, he had at least fourteen guests, excluding his own family, at a Twelfth Night celebration. Christmas 1769 was one of many that George Washington spent in Fredericksburg. It is the only one for which he recorded his activities, however. He spent time with family, he enjoyed several good meals, he went to church, he drank at a local tavern, he won some money at cards, and he attended or hosted several celebratory gatherings. All-in-all, his was a Christmas spent in ways not all that different from the ways many of us will spend our own holidays. Theophilus Bradbury quoted in Laura F. Winner, A Cheerful & Comfortable Faith: Anglican Religious Practice in the Elite Households of Eighteenth-Century Virginia, New Haven, CT: Yale University Press, 2010: 130.